The Light Show Project is an ongoing experiment. We’ve seen it built up to include elements like RGB LEDs (from the first shows with single colored LEDs), servo motors, and water pumps/fountains. I like to try adding something new with every show so that’s something fresh to play around with to make each show a little more unique to each other. In the next show, I’d like try incorporating a continuous servo motor somewhere. One of my ideas was to try and create an effect like scrolling stars or dots that would shine on the backdrop towers of the light show. The experiment with a rolled piece of cardboard with holes punched in it didn’t work very well. I was hoping the light from the LED would be brighter since I was using a resistor that would get the rated 20mA through the LED. I also think that the scale is too small to be able to produce any decent effect on the full width of the backdrop. 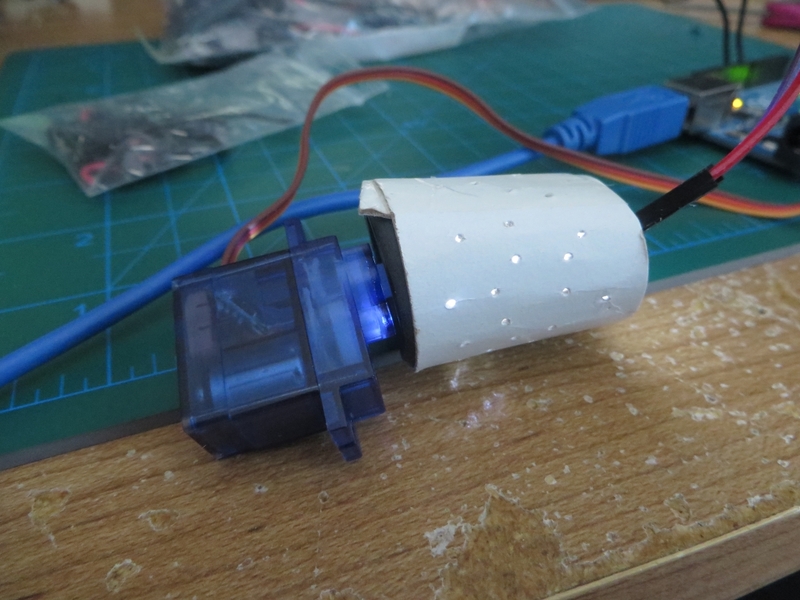 If anything, I wouldn’t use the motor for this and just have a line of cardboard with poked holes and several white LEDs behind it. Then I started experimenting with this foil tape that’s used to seal air ducts. I covered the same rolled piece of cardboard. It created a sort of water reflection on surfaces but it’s very subtle. I think the foil tape can be used in other applications, like covers over some of the LEDs to make a more focused beam of light. 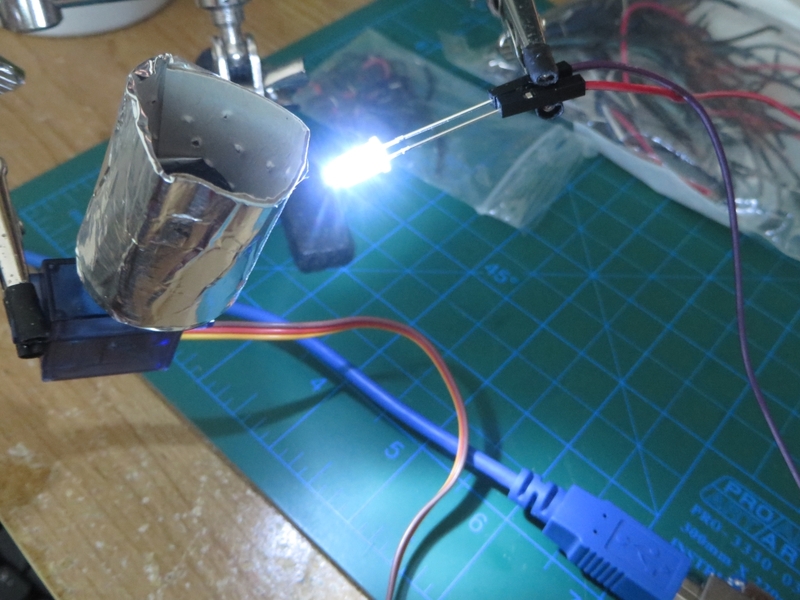 The foil is conductive so it will need some insulation of the LED leads are inside of that. That’s for another experiment. I want the starlight effect because I’d like to go back to mixing several songs within one show so we can have an array of song genres in one video, from fun pop party song to a gentle slow song, which is where the stars effect would come in. I’m still thinking of how to go about it. Stay tuned!